Welcome to Pumpkin Decorating at Sturbridge Yankee Workshop. We love to celebrate the upcoming fall season with an abundance of pumpkin home decor because pumpkins are perfect to display right through the Thanksgiving holiday. 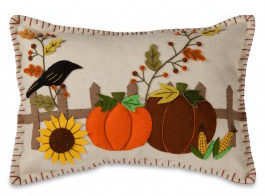 At Sturbridge, we have pumpkin characters, pillows, prints, rugs and more. The harvest season inclusive of Halloween, is the perfect time of year to display the deep oranges, golds and rusts the autumn season presents. Below we categorize our pumpkin decor to better serve your needs of decorating with this theme. A beautiful new accent rug this season that will look charming in your entryway or perhaps near the kitchen sink, is none other than our Pumpkin Candy Corn Jute Rug. Made of 100% natural braided jute, the painted pumpkin with swirling candy corn vines is designed by artist Susan Burd. 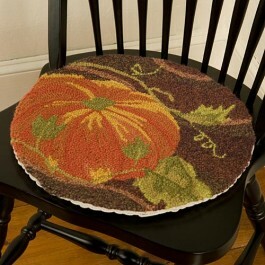 Or, you might consider our Pumpkin Hooked Rug for a more bold pumpkin look. Three bright orange pumpkins form the focal point, accented with twisty vines and an array of autumn leaves, in 100% hand hooked wool. Speaking of hand hooked wool, at SYW we have hooked wool pillows, rugs and chair pads; all featuring the orange gourd-like squash. A great example is our Wool Hook Harvest Pumpkin Chair Pad, shown here to the left. 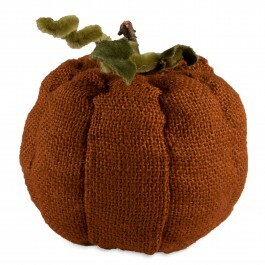 Made of 100% hand hooked wool, this chair pad brings the beauty of a pumpkin patch to any casual dining environment. New this season our Harvest Pumpkin Pillow, also crafted of 100% hand hooked wool, allows for detail in color and shading to be shown. Don’t forget the kitchen when decorating with a pumpkin theme, it’s most likely the room you spend most of your time in. Our Pumpkin Wagon Salt & Pepper Set is an adorable way to showcase pumpkins in a functional manner. Whimsical yet practical, these shakers are made of durable ceramic and are nestled into a cute metal wagon. When cooking, another handy pumpkin accent to have in the kitchen would be our Alice Backman designed, Pumpkin Potholder. Made in the USA of 100% cotton, this potholder is machine washable and features a silver cloth, heat proof backing. ~ For more Pumpkin Decorating ideas click: HERE.